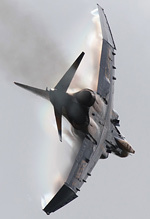 When the 'Phantom Pharewell' event at Wittmund was announced, many enthusiasts from across Europe decided it was a must to see the mighty F-4 retire in style from German service after four decades of operation. With two days of public access to Wittmund planned and with the promise of Phantom flying displays, it certainly sounded like an event befitting to send off such a well-loved type. Peter Reoch travelled to Germany to report for UKAR, with photography from the UKAR Staff Team. The weather over the retirement weekend was less than ideal, with the weather during Thursday & Friday arrivals days being similar to that more commonly experienced at Fairford arrivals! 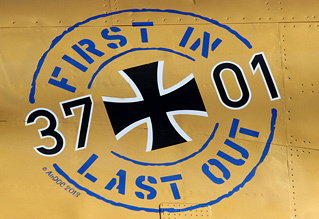 This led to notable cancellations from the line-up including the Polish MiG-29 and – more importantly – the Hellenic F-4E. 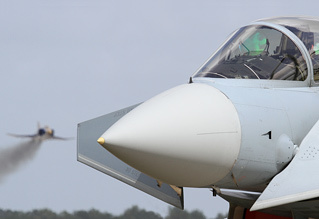 However the line-up of visiting aircraft was still strong with various types from the German military, including AG 51's new artic tiger schemed Tornado ECR and JG 74's new tiger tailed Eurofighter. 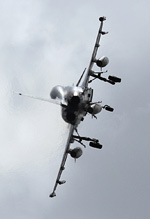 Foreign visitors included a trio of Belgian Vipers, British Tornado GR4's & Hawk T1 and a pair of Spanish Hornets. On the Friday, a large number of German Phantoms were positioned infront of shelters, without barriers including the 'Phantom Pharewell' schemed 37+01, the retro schemed aircraft and the WTD-61 retirement special. There was also an aircraft on jacks in a maintenance hangar and 38+28 in new special markings parked inside a shelter. A dynamic aspect of the Friday was a Phantom performing cartridge starts and static engine runs on the crowd line, a truly awesome sight which was much appreciated by all in attendance. The use of wooded areas and aircraft shelters as backdrops makes a change to the backgrounds seen at most UK airshows and photocall events and was appreciated by many of the 3500 visitors in attendance on the Friday. The main event of the weekend though was the Open Day on Saturday, which would act as the F-4F's official retirement celebration from German Air Force service. The static displays on offer were vastly altered from those seen on Friday including the addition of barriers around many of the aircraft, which were sadly far too close for photographic purposes. Along with the static aircraft, there was two “flight shows” planned during the afternoon, a historic section in the morning with the Phantom section in the afternoon. The historic selection was due to include a replica Fokker DR1 triplane and EADS Bf-109 which were sadly both unable to fly. 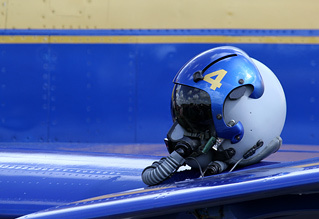 This left the Yak-52, Boeing Stearman and Bucker Jungman to open the display, with solo routines. Airshows are still a very alien concept in Germany and this was evident both in the basic nature of the flying routines and the crowd's excited reactions to the simplest turn or wing-waggle. 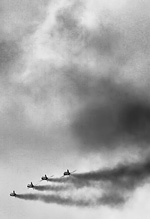 A Bolkow Bo-105 from the German Army also took part in the morning show, with a spirited aerobatic display. Another example of the Bo-105 was also on display in the static park, a welcome addition given the types fast approaching retirement from service. The final item of the mornings programme, was an unexpected flying appearance from a A-4 Skyhawk, based at Wittmund and operated by BAE Systems. The Scooter performed a number of simple flypasts in various configurations to the delight of the visiting photographers. Unfortunately the aircraft developed an inflight fault and landed using the arrestor gear with the emergency services responding as a precaution but all seemed well as the aircraft taxied off the runway under its own power. The afternoon saw an hour and a half of flying dedicated to the Phantom and its replacement, the EF2000. Four Phantoms took to the air for a variety of 4-ship formations before splitting up and making a series of extremely impressive low approaches and fast passes. Part way through the F-4F's aerial segment we saw the arrival of two of JG71's new aircraft, the EF2000, which made a formation pass with a pair of Phantoms before landing and parking up infront of crowd centre. Following this, three of the aircraft landed leaving the 'Phantom Pharewell' schemed 37+01 to put on a simple but effective solo display. Once completed all of the four Phantoms taxied to take their place at crowd centre, parking next to the EF2000s. The simultaneous shutdown of eight J79 engines marked a sad end to a well loved aircraft's operational history with the German Air Force. The organisers and all those at Wittmund did a fabulous job of organising and managing the event, especially when you consider the lack of expertise of running airshows in Germany due to their absence. The shuttle bus parking system worked excellently with no traffic congestion around Wittmund, a system that some UK shows could look to implement to avoid traffic issues perhaps? The food on offer was of a high standard and sensibly priced, there were plenty of toilets and the fairgrounds didn't impede access to the static aircraft. The event was mainly hassle free and extremely enjoyable, with the only irritations of the event coming from rude photographers (both European and British sadly) and the positioning of the static barriers on some of the aircraft. 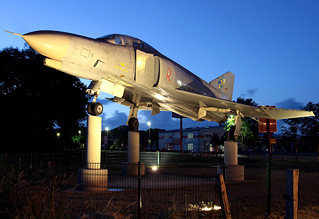 The event on Saturday marked the formal retirement of the F-4F Phantom II from German Air Force service, and in the week after the show the fleet performed their final flight to nearby Jever, where they will be scrapped. It is currently unclear if any airframes are planned to be preserved other than the 'Phantom Pharewell' schemed 37+01 which will become a gate-guard at Wittmund. 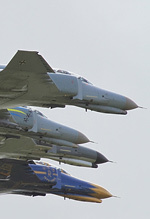 The retirement of the mighty F-4 Phantom from German service is a sad occasion and their retirement will be a great loss to UK airshow circuit, with Wittmund based Phantoms becoming regular stars of the static displays at many shows of the years. However the style and quality of their retirement event is a pleasant change to the current trend of low-key type retirements and the special schemed aircraft on display over the weekend reminded everyone that the Germans are certainly still the kings of the special scheme!